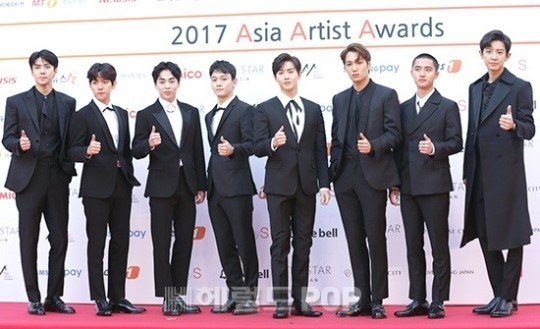 K-pop boy band EXO and actress Kim Hee-sun scooped up the grand prizes for best singer and best actor, respectively, at the 2017 Asia Artist Awards on Wednesday at Jamsil Gymnasium in Seoul. EXO took home four trophies at this year’s AAA. In addition to winning the grand prize for the second consecutive year, the group also received the Fabulous Award and Popular Award. Its member D.O., also known as Do Kyung-soo, won the Popular Award as an actor. Kim Hee-sun, a top actress from the late 1990s, won the grand prize in acting. Boy band Super Junior won the Legend Award and Fabulous Award while K-pop super rookie Wanna One grabbed the Rookie of the Year Award and Samsung Pay Award. The honorary Asia Icon Award went to actress Park Shin-hye while the Asia Star Award went to singer-actress Suzy. Singer-actor Lee Seung-gi, who was discharged from military service on Oct. 31, received the Best Welcome Award. The Asia Artist Awards honors the outstanding achievements and international contributions of Asian artists in film, television and music, based on big data.